With the holiday right around the corner, I expect to be doing some shopping and lots of BAKING. As I stock up on sugar, flour and chocolate chips, my heart fills with anticipation thinking of all the scrumptious treats I will be making for my family and friends. Creating the treats is tons of fun, but the part I enjoy the most is watching people savour every last delicious morsel. No matter whether it is an annual tradition or your first attempt, there are some essential supplies to have ready before beginning your marathon baking adventure. I’ve put together a list of my must-haves to give you a head start. You won’t want to waste time washing baking pans between batches so it makes sense to keep a few extra around. I borrow extra pans from my mom and send them back with the treats and she thinks it’s a pretty good trade-off. This sounds obvious enough, but measuring cups and spoons are not all created equally. I prefer the ones with the raised up numbers that won’t wear off after repeated washings. One set is never enough because you will switch from wet to dry ingredients and don’t want to be washing them in between. I measure everything to be on the safe side since I don’t have that magical ability to guesstimate that Grandma has from years of experience. Many recipes call for these helpers. Make sure you have on hand aluminum foil, wax paper and parchment paper. Also good to have is some plastic wrap to cover finished treats. Last year, I grabbed a few plastic containers and nicely decorated tins from the Dollar Store to present my treats in. Add style to your shortbread cookies with cookie cutters. They don’t cost much and come in many fun shapes so you can make loads of Christmas trees, snowflakes, and gingerbread men. I use almost every bowl in the house when I’m baking. Remember, many recipes will have you mixing up different components that can’t touch till the time is right so you will need many mixing bowls. If it’s in your budget a stand mixer makes a good assistant in the kitchen stirring away while you save your arms and move on to the next step. Otherwise, a handheld mixer works just fine. I used the same one for 10 years of holiday baking. Get a good pair of oven mitts and use them every time you touch something that has been hot to protect your hands and arms. I have grabbed a pan that was still too hot in a hurry before and it won’t happen again. It’s also a good idea to have a couple pairs in case something spills on them. I have the silicone set which is good for gripping and a cloth pair with snowmen on them. A festive apron won’t make anything taste better, but it certainly makes it more fun for me to get decked out and look the part. I love having happy upbeat tunes playing when I’m going to be in the kitchen for a long time. It doesn’t have to be Christmas music either. Try some of your favourite feel good songs to keep the energy up. Sing along and bake on! Find the things you already have in the cupboard and gather up the stuff on this list and you will be on your way to tasty times. 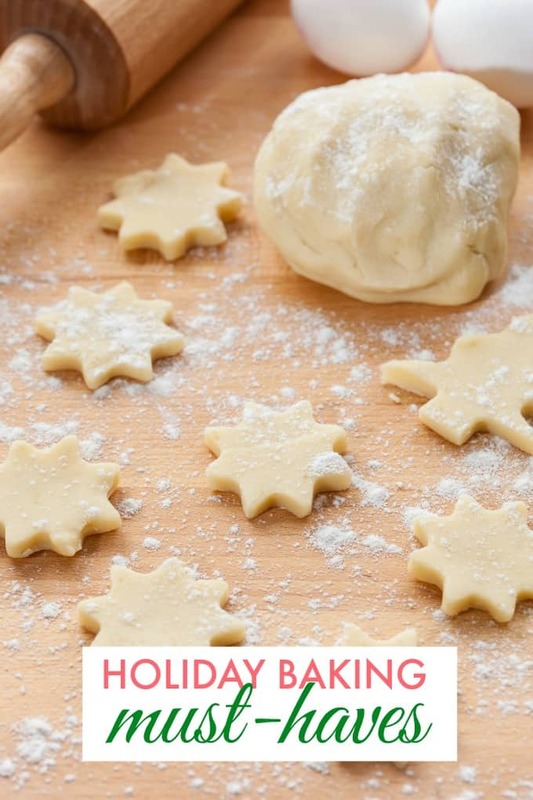 What is on your holiday baking must-haves list? You might also like these Rice Krispie Cookies, Cream Cheese Cookies and Gingerbread Whoopie Pies. This is such a good list! We need to get out kitchen stocked for holiday baking!